This year has been one of challenges. I have fallen in love with them as they give me a hint of a direction and then push me to grow. Before this particular challenge I have really no idea just what an Art Charm would be. And I want to thank our lovely hostess Jennifer Cameron of Glass Addictions for her patience with all my questions. The requirements were that we each had to make eleven charms one of which would be donated to an auction benefiting Beads of Courage. If you haven't heard of Beads of Courage, they are a wonderful organization that gives out beads to children with life threatening illnesses when they undergo different treatment milestones. This really helps to keep spirits up for these brave kids. There are a lot of definition of an art charm out there on the internet but my take away is a charm made by manipulation. One could make the charm of ceramic, glass, clay. Or for those of us that don't make beads one could take things that are handmade and combine them. And for the direction, our theme was laughter. Now this one was a bit of a toughey as I am not one to break out in laughter. So instead I thought of things that are guaranteed to put a smile upon my face. And one would be watching a flock of birds dancing in the air on a warm blue day with wisps of clouds floating by. Now that I had decided on the concept the design came together rather quickly. I used lampwork spacers that I picked up on Powers Art Studio(they have some really nice beads at reasonable prices), Swarovski crystals, and the birds that are lead-free pewter from TierraCast. I did some light wirewrapping using sterling to bring it all together. I really had a lot of fun with this swap and will be joining the next one that I stumble upon. All of the charms that I received are so unique and so gorgeous. Be sure to check them out as you will be amazed. Just click here for the list of participants. And if you would like to add some wonderful charms to your collection and help out a great cause click here. Shaiha, what a beautiful interpretation of a scene that fills you with joy... the quiet laughter in our souls is as important as the LOL's we share publicly. Very nice, That is a comforting smile they create. I was thrilled to be in your group and receive this wonderful charm from you. I loved your interpretation of the theme. Thank you so much!! I LOVE IT! Your charm perfectly depicts your happy thought. I am going over to bid... I am so happy that so many of you rose up to the challenge to help these children and their families in such a fun, loving way. Very pretty -- my sheltie chases anything that flies over our mini farm -- that makes me laugh constantly! Loved reading your inspiration for this challenge. Such a happy, uplifting thought! Great job on the charms! Very pretty work indeed! 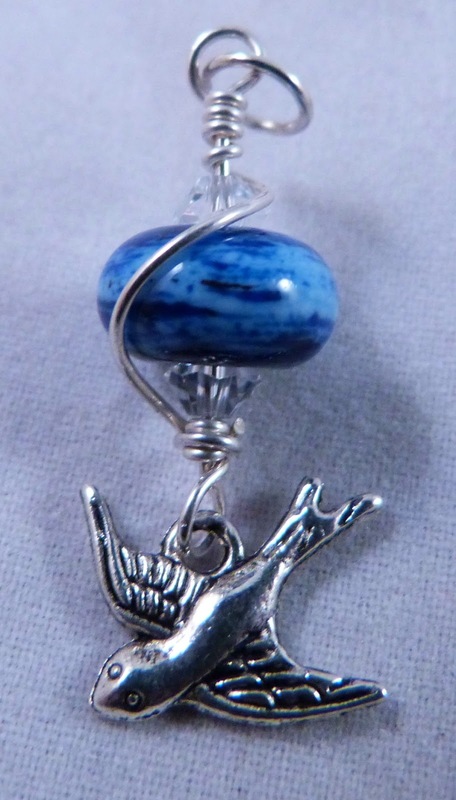 Love the striking blue& the cute bird charms 'goes' perfectly with them!